What would you expect of a program that is called Dealicious? Perhaps something good related to your regular spending? However, Dealicious is just an adware application that is there to help its creators make easy money by displaying commercial advertisements embedded with outgoing links to third-party websites. This kind of business plan is not something illegal, but you should not wait any longer, because the sooner you remove Dealicious from your computer, the better. This program could be easily exploited by cyber criminals, and you most certainly would not want that to happen. Judging from the application’s website at getdealicious.com, the program is promoted as one of the best tools out there that can help you find the best deals online. What’s more, Dealicious is promoted as a safe application that is compatible with Google Chrome, Mozilla Firefox, and Internet Explorer. However, we are highly concerned about the application’s security, because adware apps like Dealicious are very far from being as safe as is promoted at getdealicious.com. In fact, the program is vulnerable enough to display commercial advertisements that contain unreviewed third-party links. It goes without saying that if cyber criminals decide to make use of this application, they could easily embed their own content into Dealicious ads and consequently you could be exposed to malware distribution schemes. If you are reading this description, chances are that you are constantly being annoyed by the Dealicious ads, coupon offers, and other pop-ups. Users who complain about this application also often do not know how it managed to enter their systems because they clearly have not downloaded it from the official website. The point is that Dealicious gets distributed in third-party installers with SuperWeb adware, Multiplug adware, the Mindspark toolbars, and other potential computer security threats. Consequently, users often do not realize they install more than just one unwanted application, especially if they download a software bundle from a third-party file sharing website. This kind of distribution method is not surprising at all because it has been utilized by PriceExpert, Price Wagon, PriceRocket, and many other applications from the Shopmania family. As you can probably tell, Dealicious comes from the same group of adware applications as well, so it is clear that you should not keep this program on your computer. Please follow the manual removal instructions below this description to delete Dealicious on your own. Do not forget to terminate other potentially dangerous applications that might be running on your computer. If you need professional assistance with software removal, please consider investing in a licensed antispyware program. This would be your best bet for safeguarding your PC from harm. Select Uninstall a program and remove Dealicious. Go to Uninstall a program and remove Dealicious. Open Add or remove programs and uninstall Dealicious. 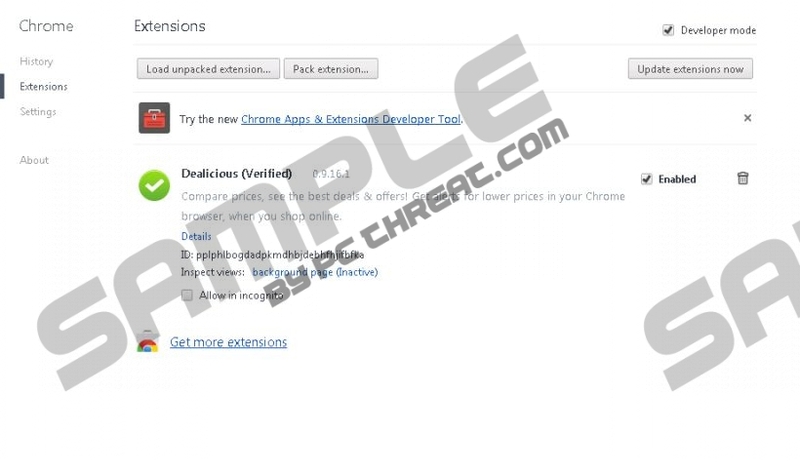 Remove Dealicious from Toolbars and Extensions. Disable and remove Dealicious from Extensions. Select Extensions and remove Dealicious from the list. Quick & tested solution for Dealicious removal.